A couple of years ago, I decided that I had enough of hotel rooms. No more sagging beds despite four stars and unbearable attitude at reception desks, no more plastic kettles precariously placed on a side table with no socket in side, and interior design that would have made my mother cringe. I was fed up with the anonymous feel whilst paying a high price to get a vacuous yet contemptous fake smile at the reception. So I went Airbnb. 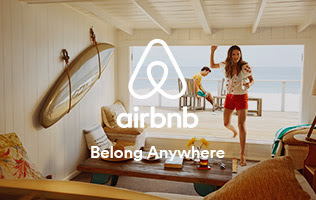 For those of you who do not live in the shared economy, Airbnb is an internet platform that allows you to advertise your own four walls to other people. Airbnb manages all the money transfers between your guest and yourself, takes a fee for this service and guarantees you in turn a potential customer base of several million people across the world who want to stretch out their tired legs in your living room. Over the years, I have found Airbnb nothing but an impeccable service, rapidly responding to my emails or calls when things go wrong. Stepping into someone else's flat. The Airbnb promise. The beef I have (and I do have a beef) is with those who embark on the Airbnb path without the necessary skills or readiness to be a host. Essentially, Airbnb has two types of 'hosts'. The first type is the private citizen who happens to have a spare room and does not mind a complete stranger putting their feet up in the living room. Making some pocket money at the same time helps. This type of host may be attentive or not, considerate or not, clean or filthy, absent or present...whatever he or she is. You know what you get since you know you will enter someone's private abode. More recently, however, Airbnb has attracted a lot of business clients as hosts. These are basically companies (single self-employed investors or large scale investors) who buy up property to rent it out via Airbnb. I doubt that the profit margins are very high, given that those apartments are usually fully serviced but whatever the gain, the problem I have is not with the professional companies playing host (they are not much else but hotels offering apartments instead of single rooms) but the self-employed, self-taught wanna-be host. You know who I mean. The one who has two or three mobile phones, a fake Rolex watch, and drives an Audio A8 (on credit). Whilst looking all 'proper business like' (so they think) what they fail to grasp is that running a business like renting out an apartment (or many!) takes good organisational skills and a sense of how to manage your time and resources. That's where they fall down. How often have I stood in front of a locked door at the agreed time, desperately ringing the sole phone number given to me by Airbnb without a host anywhere in sight. If you are lucky, you might get an email saying that, at the present time, your host cannot be at the apartment as arranged but will be there soon. 'Soon' is usually not specified and can mean anything from a couple of minutes to several hours. Most of these hosts are in fact nowhere close to the specific apartment you would like to stay in. In fact, it always struck me as extraordinary how many of my 'hosts' where living in Florida or Paris whilst the flats they rented out were some thousands of miles away in the Costa del Sol or Munich. For these 'absent' hosts, luckily there is always the helpful neighbour close by... well, not quite. Since the hosts probably never lived in the flat themselves, they have no relationship with any of the neighbours who lived there for years. In fact, at times, the neighbours often don't even know that the flat is rented out through Airbnb. Worse, because these hosts rarely know the flat they are renting out themselves, they rely on the cleaning service to tell them details and sort out problems. Most recently, I arrived at an apartment in a house that was completely scaffolded from floor to rooftop with some builders cheerily hacking off the outside plaster with sledgehammers whilst I was anxiously trying to phone my host to see if any alternative flat would be available. When I got through to the host, he had no idea the house was actually being regenerated and had been gutted from top to bottom. Needless to say I was slightly miffed about this teeny weeny bit of ignorance. But that's nothing compared to the 'host' who rents out a flat that isn't even his. This happened to me a couple of years back where, in the second night, someone else came into the apartment who was quite surprised to find me there. It turned out that somebody had rented out a flat that wasn't even his, but which he had shared previously. Having held on to the key of the flat, the fellow thought it would be cool to advertise the flat on Airbnb to make a buck on the side. In all this, I have to stress, Airbnb itself has been absolutely without fault. Whenever the hosts messed up, Airbnb bent over backwards to make it right. But I think I am just growing a bit tired of poor organisation, hiccups and absent landlords. I might just have to go back to tiny rooms with kettles on the floor and windows I can't open whilst the aircondition is rattling away. In all likelihood, gatekeepers can do everything for the best in class presence of their kids and they act extraordinarily hard to make their children's https://www.thebestessayservice.com/carefree. They kill their own special needs for the possible destiny of the adolescents and work day and night and wish to have better life for their newborn children.